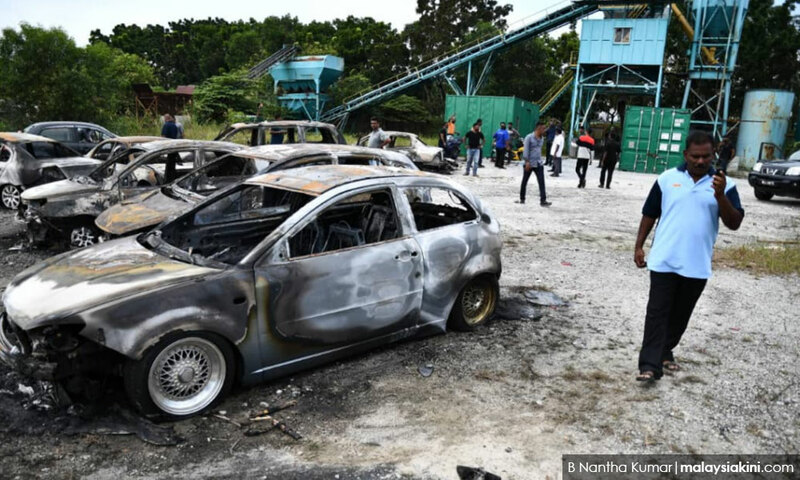 A lorry driver was charged at the Magistrate's Court in Petaling Jaya today with obstructing civil servants from carrying out their duties, as well as rioting at the Sri Maha Mariamman Temple in Subang Jaya, Selangor, a little more than a month ago. M Chandran, 32, pleaded not guilty to the two charges read out before Magistrate Nurshahirah Abdul Salim. A group, including Chandran and several others who are still at large, was jointly charged with obstructing Inspector Mohd Nazmi Zulkafli, Sergeant Mohamad Faiz Abdul Rahim and Corporal Ahmad Zamran Mat from carrying out their duties. On the second count, Chandran was charged together with 50 people, several of whom are still at large, as being a part of a group using criminal force which prevented a police patrol car from exiting the temple premises. All the offences were allegedly committed at the front entrance of the temple located at USJ 25, Subang Jaya at 1.30pm on Nov 26 last year, and they come under the purview of Section 186 and 147 of the Penal Code, with each charge carrying a maximum jail term of two years or a fine, or both, upon conviction. Meanwhile, an unemployed man also pleaded not guilty in front of Magistrate Mohamad Ikhwan Mohd Nasir for mischief by damaging a vehicle at the same location, at 4.30am, Nov 25 last year. A Janagan, 33, was charged, together with several others still at large, with damaging a four-wheel drive Nissan Navara with the registration number WVS 3776, belonging to the company Modular Construction Technician. The charge under Section 427 of the Penal Code provides for a minimum jail term of one year or fine or both, upon conviction. The court allowed Chandran bail at RM3,000 for both charges in one surety, while Janagan was allowed bail at RM2,500 in one surety with an additional condition to report to a nearby police station twice a month. The court fixed Feb 15 for the mention of all the cases. Deputy public prosecutor Mary Phoon Keat Mee and Nor Baizura Mohd Saubian prosecuted, while both the accused were represented by counsel R Balamurali.